A Shawnee chief, Tecumseh traveled extensively in an effort to unite various tribes in order to make effective resistance against white invasion of the Ohio country. He allied himself and his followers with the British during the War of 1812 in hopes of stemming the tide of American westward-moving settlement. 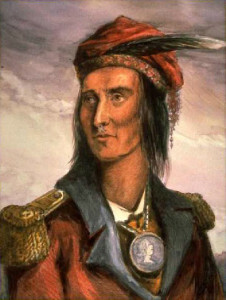 Although he succeeded in drawing together more tribes than any previous leader, Tecumseh was killed at the Battle of the Thames (in Ontario, Canada) on October 5, 1813, by troops under William Henry Harrison.